A lot of times we feel that we are alone, broken, falling apart. When I saw this dock on the side of the road that is what came to mind. It also came to my attention how peaceful it looked, standing out there, the framework still resisting the elements almost as if to say, I still matter, I still exist, I am something real. 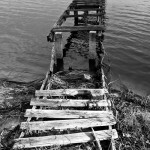 I don’t know why this wooden dock was abandoned, why no one seemed to care about it anymore. Is is difficult to understand how we can spend so much energy building something up only to let it fall into ruin, but it happens all the time. In families, in marriages, in our hearts, even in our walk with God. 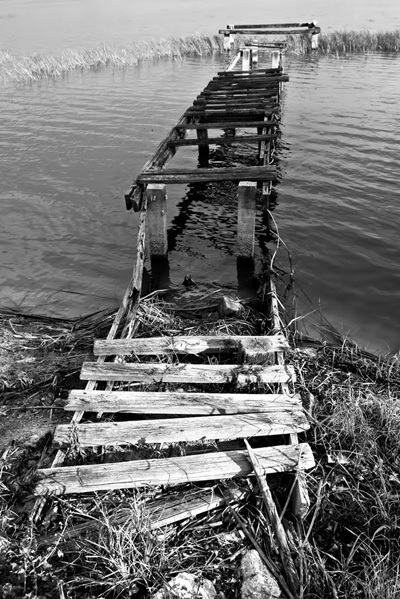 While this dock might be beyond repair, as long as we are breathing, we are not. As long as we have a heart beating in our chest we are not beyond saving. Our hearts, our lives can be pulled from the muck at the bottom of whatever pit they lye in and restored. Only God can do this, and, depending on how bad it looks, He might be the only one who wants to. I believe that a photo truly can speak to us. I hope this one speaks to you, and reminds you even when you feel washed up, broken down, and like you are falling apart, as long as you are alive, you matter.